UN Photo/JC McIlwaine Electric cars. An automobile revolution is coming our way – only you might have trouble hearing it this time. Oslo’s experience shows that it is possible to boost the sales of electric vehicles (EV), that they work in a rough Nordic climate, and that a major shift could be just around the corner. Rapid and promising growth in large cities in California, China, Korea and Europe is fuelling optimism across the globe. For the first time in history, more than half of all new cars sold in Oslo are electric; the city is today often referred to as the EV capital of the world. With a record high of 39% of all new cars being fully electric, Norway is by far the country with the highest market share for EVs by capita globally, even if Los Angeles, Beijing and Shanghai have higher sales in absolute numbers. 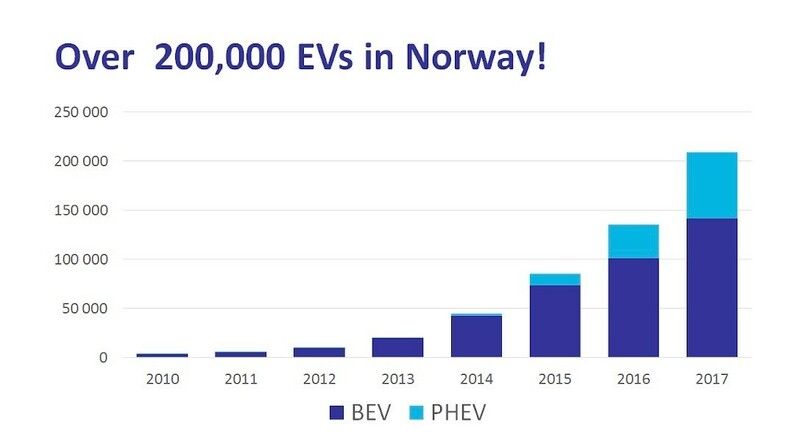 A graphic illustrating the rise in EV use in Norway. BEV stands for Battery Electric Vehicle, while PHEV means plug-in hybrid vehicle. In Oslo, more than 50% of new cars sold in 2017 were either fully battery electric (37.5%) or a plug-in hybrid (14.1%), according to the Norwegian Road Federation (OFV). The exponential growth of EV sales in Oslo is continuing, with a 53% sales share for electric vehicles so far in 2018. Today, electric cars make up 16% of total cars in Oslo, with 9% fully electric cars and 7% plug-in hybrids. It takes time to change the game completely and convert all cars from diesel and gasoline to electric. But a major transition towards zero emission cars is now well on track, with the growth much faster than anticipated a couple of years ago. Based on the following evidence, green taxes (on less polluting vehicles) and other incentives have indeed worked. Consumers have embraced EVs in increasing numbers because the public sector has made it sensible, affordable and simple for people to make green choices in their daily life. The exponential growth of EVs, with annual sales increase of more than 100%, was surprisingly high, even for the most optimistic among us. Fantastic as it is, it also creates challenges. For the first time since 2008, it is hard for EV drivers to find an available charging point in central Oslo; the number of available charging points per vehicle have dropped from one charger per four cars, to one charger per 10 cars. However, there is a solution: not only to boost the number of chargers, but also to make the charging infrastructure smarter and more efficient. The city council recently decided to go up a gear and triple the deployment of new charging points. In close cooperation with private companies, Oslo will build fast chargers in the corridors in and out of the city. A large network of semi-fast chargers (7.4-22 kW), with a higher charging speed and higher turnover of cars, is being deployed to ensure a more cost-efficient system and less use of limited public space. The world’s first indoor parking for EVs only, Fortress, has also been part of accommodating and supporting Oslo’s growing fleet of zero-emission cars. Everything is connected to everything else; to bring about a green shift in transportation, you need to think holistically. EVs are only part of the equation. Oslo will need to scale up green public transportation and public transport on demand, and increase the focus on pedestrians and cyclists, as well as autonomous vehicles and Mobility as a Service (MaaS). Increasing freight by railway and introducing green freight distribution in the city, zero-emission heavy-duty vehicles and zero-emission taxis are also part of the new Oslo model’s holistic approach to becoming fossil-free by 2024. Green public procurement, goods and services delivered by zero-emission vehicles and good park and ride solutions, in combination with EVs, and an increased use of intelligent traffic systems (ITS) and artificial intelligence (AI) to make the EV use swift, efficient and user-friendly, are equally necessary for the Oslo model’s success. Today, we have an historic opportunity to convert all vehicles to zero emission – private vehicles, commercial vehicles and public transport. But we need the right regulatory framework, public-private cooperation and the resilience to succeed. The global future will depend on a lot of variables including: the political willingness to use green taxes, regulations and other incentives to make the shift; technological developments for vehicles, batteries, chargers, autonomous vehicles, AI and ITS; global price developments for alternative fuel such as gasoline and diesel; national and transnational cooperation, involving local government, national government and private businesses; global cooperation and free exchange of examples and ideas – like the World Economic Forum’s report on Electric Vehicles for Smarter Cities: The Future of Energy and Mobility; and sound business models that can help finance the green shift in transport. Factor those in and a newer, cleaner age of motoring will be available to everyone.